Hey mama, I know you’re busy with your little ones, you have laundry to fold, and a house to manage, but you’ve also got a biz to run. Sometimes it feels like your biz takes the back burner, after all, you became a mamapreneur to be able to put your family first. I know how valuable the time you have to work on your biz truly is. And that’s exactly why you need to be using daily goals to focus your energy & time to make.things.happen. I’m ready to see you succeed, I’m ready to see you reach your dream biz & hear you say “I’ve made it!” Are you ready? Confused? 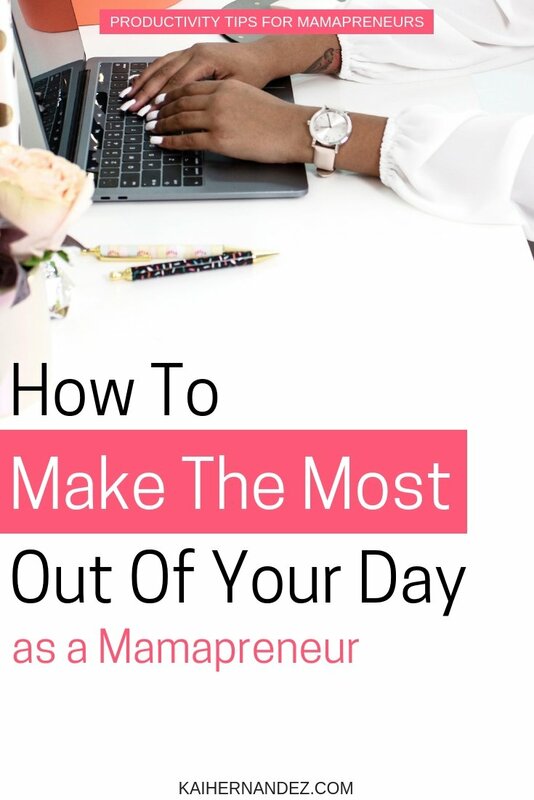 I’ll bet that you were expecting to see a simple list of things like stop multitasking, have an awesome morning routine, or how to batch tasks to save time. And yes, all of those things are great ways to be productive, actually knowing where you want to go ensures that the time you spend on your biz is worth it! No matter how productive you are, or how organized, or how talented, you aren’t gonna reach your dreams if you don’t know what they are. Nothing kills your dreams faster than not even knowing where you want your biz to go. It will leave you following what other biz owners are doing, and at best, you will come in second at their dreams. First, know your dream biz, then figure out how to get there. Once you know where you want your biz to be, then you gotta figure out how to get there. Break down your goals into time-frames to realistically made progress on your biz. Sounds easy, right? The hard part, is pushing all other things and ideas back until you have achieved your daily goals. Imagine a great new idea pops into your head, or you see someone else in your niche doing something super cool. Guess what, unless it is directly in line with your dream biz, you gotta put it on the back burner. Remember – its so easy to jump from new fad to new fad, never really following through. But that isn’t gonna get you to your dream. Here’s what will. Look at your long-term biz goals. What does your biz need to look like in 3 years from today to be on track? What about 1 year from today? How does your biz need to look in order to hit your 3-year biz goal? Now that you have your 1-year biz goal. It’s time to break that up into quarters. Generally I would say to stick with 3 main goals per quarter. Don’t overwhelm yourself with too many goals than achievable, you will either feel like you failed or you will have done everything with half effort. Keep your goals few & be specific! Really try to push yourself with these goals. The standard biz quarters are January – March, April – June, July – September, October – December. Below I will list a few things related to each quarter if you aren’t too familiar with planning out your biz in this way. No need to stick to what I say or recommend though, you know your biz best ? In the first quarter this is where you start to lay out the foundation. Even if you have already been at this for years, take this quarter to focus on your foundation again. Things change, platforms change, your audience changes. Know what platforms you need to be on for social media, products, and marketing. Start to gain knowledge about these platforms and testing them out. Or if you’ve already got a platform locked down, create a fresh new content plan testing out brand new things. Make this the quarter to focus, take risks, & evaluate. If you’re using information marketing, which is just a fancy word for blogging to generate traffic to your product, start creating your content now. Work on any of the first steps you need to get to your 1-year goal here. Really try to layout a strong foundation, I know sometimes it’s tempting to do what’s easy, but you never know where your biz will gain an audience if you just stick to what’s comfortable. If you wanna learn more about how to build a content strategy without going crazy, check out GaryVee’s Content Strategy. Now that your content is under control, start working on you’re product, or other income generating leads. This quarter is mostly about focusing 90 days of pushing toward your goals hard. 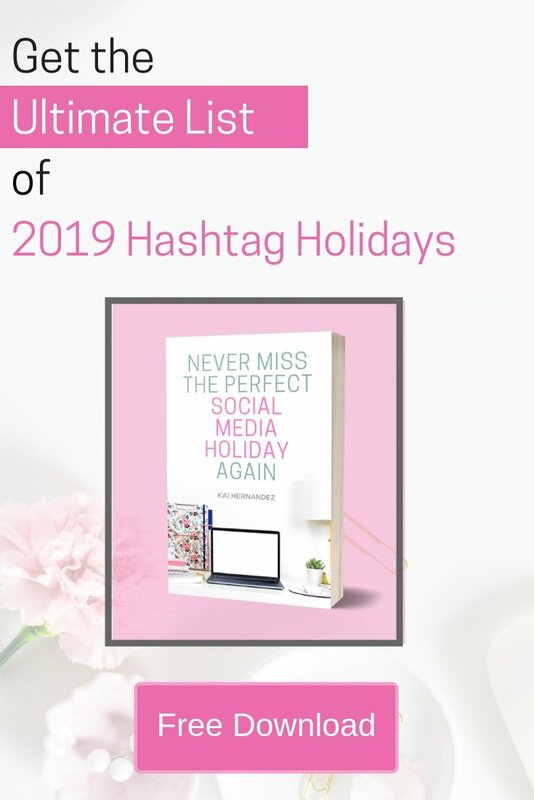 This is generally when the summer slump hits, or maybe your biz is one that thrives in the summer with everyone’s vacation schedule. This is the best time to start planning for the holidays! This is the start of the holiday season. If you didn’t plan for it in Q3, then you will be scrambling now. Try to focus on getting your customers where they need to be. Whether that’s to purchase your product as a gift, click affiliate links to get a sweet commission, or something else. Now that you’ve got your quarterly goals, it’s time to break them down into the three months of the quarter. Ya’ guessed it, you’re gonna do the same thing with each monthly goal. Yep, ya’ already know the drill. Same thing, smaller scale. This time, you’re breaking from the rule of 3. In all honesty, you can totally try out doing three goals a day, but I stick to just 2. It gives me time to dive deep and it works with my schedule of only working while my daughter sleeps. I also personally practice having just two goals for the entire weekend as I see the weekend as family time, but that’s just a work boundary I have created with my family. If weekends are your work time, go for it! Alright, I know we got a bit sidetracked with all that detail, but it’s only with that planning that you can get to the point of having purposeful days. Avoid multitasking at all costs, focus on your daily 2 until they are done. Keep your desk clutter-free & distraction free. Clear your desk before going to bed so you can start fresh in the morning. Stick to your work & family boundaries. Wish there was a system to help you do this? 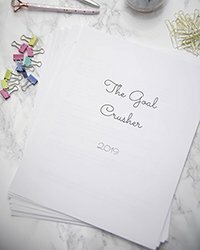 The Goal Crusher printable biz planner helps you break down your dream biz into manageable daily goals, set goals & track your social it’s, income, & much more.